We explore the rolling hills of the 9th Mile Toda settlement with the Keystone students. This first week at Keystone has been a whirlwind of sensations—new sights, new smells, new language, new landscape, new birdsongs. The colors, the sounds, and the aromas all seem saturated, dripping with vibrancy and life. Bright orange soils blend to verdant green vegetation reaching up to a crystal clear and cloudless cerulean sky. The January air is crisp, cool and clean, each breath like a sip of fresh, cold water, and soaking up the ever-present sunshine I can’t help but feel its warmth rising within me in waves of profound joy. I am a stranger in this place, no more native than the fragrant eucalyptus, lantana, or silver oaks symbolic of British colonial rule, and yet already I feel at home. Already I have begun to send tentative roots into the soil, exploring its complex composition and grounding myself in the surreal beauty of the Nilgiris. 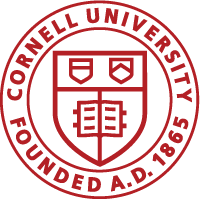 But all of us from Cornell are faced with a challenge: will we be parasites like the vines slowly strangling the Amla tree, or will we integrate ourselves as valuable members of a cross-cultural symbiosis? Like the giant rock bees, can we use the nectar of our experiences here to produce something sweet for ourselves and for and our local partners? In this first week, we have discussed different ways of knowing place and relating to the world. The Keystone students relate to land very differently than we do in the US, and I’m particularly interested in how these differing relationships to land shape the treatment of it. For our first collaboration with our Keystone partners, we created a map of the campus using only our bodies for measurement. I have always thought of maps simply as tools for understanding spatial relationships, but now I am beginning to appreciate their potential as bridge-builders. When you create a map together, even if you don’t speak the same language, you reach an agreement about the way the world is. You create knowledge of a landscape over which you have collective ownership. It is quite a powerful thing. 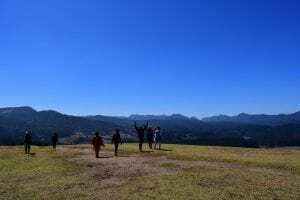 This Friday, we took a bus tour throughout the Nilgiris Biosphere Reserve. 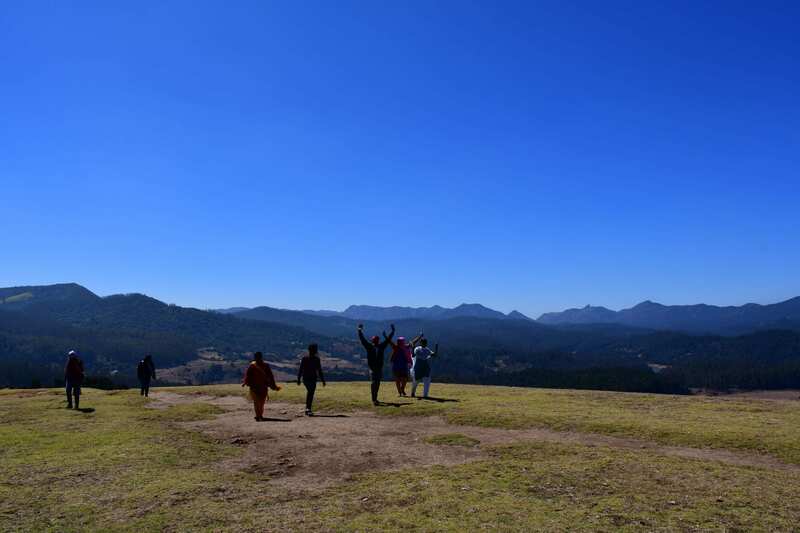 The trip was fantastic because it strengthened our relationships with the Nilgiris and with the Keystone students. We saw high-elevation shola forests and blooming rhododendron around the Badaga settlement of Thumbatty. From Doddabetta, the highest peak in Tamil Nadu,we saw hilltop islands surrounded by oceans of clouds. We visited the Toda settlement at 9th Mile, scaled the rocks at Frog Hill, and experienced the majestic low-elevation dry forest and elephant camp at Mudumalai Tiger Reserve. We blasted Tamil music and danced in the bus all the way from 9th Mile to Frog Hill, which I think is the first time we really started to come out of our shells with the Keystone students. Dancing, like map-making, transcends language. We had so much fun that, after dinner in Ooty, we danced in the bus all the way back to Kotagiri. Overall, I feel very proud of the progress we have made creating bonds with the Keystone students thus far. We have learned and done so much this week that my head is still spinning, but by far the most meaningful thing we have achieved is the beginning of deep friendships with our Keystone partners. I look forward to cultivating those relationships and watching them bloom through all of the wonderful and challenging experiences that lie ahead.